USAirNet.com gives you accurate weather prediction for a short two- or three-day span! All kinds of info is there: temps, wind-speed and direction, humidity… and more! That link, above, is focused on Kingman weather… but if you fiddle with the settings, there, you can find local weather for any airport in the nation, I believe. 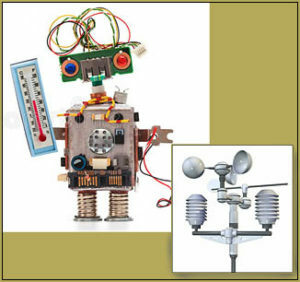 I’d love to see that robot looking like “a robot”… but, I am afraid, it looks like a remote weather station unit. Temps are reported in Degrees Celsius… the only handy facts I know about Celsius is that Zero C equals 32 degrees F… and 28 C equals 82 F … so over 28 C = headed for a hot day! Over the years, I have found the Robot to be a bit unreliable… like it tells me wind is at 12-knots, so I do not go out to fly… but then flyers report that it was actually a nice, gentle day. I hear that the robot is “talking” about winds-aloft, at altitude… ME? I think it’s just wrong sometimes “:o).